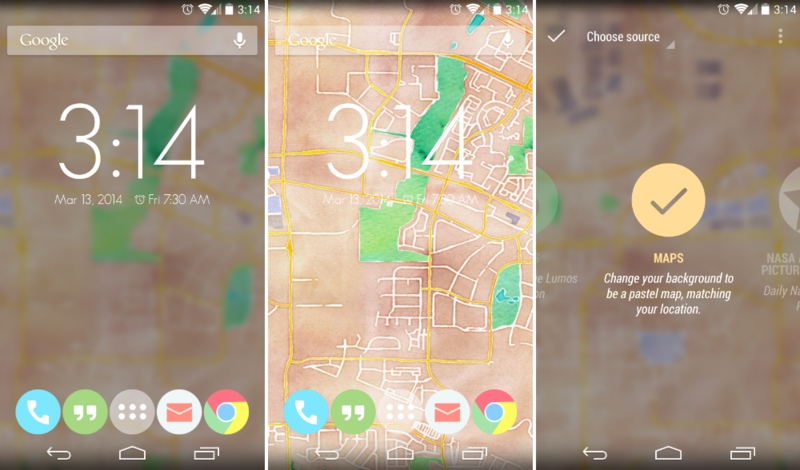 There is a new plugin for the Muzei live wallpaper app, one which brings a more personal feel to your homescreen. The plugin is called Stamen Muzei, and how it works is quite neat. Based on your actual location, the plugin will display a map of where you are, but it’s not an ordinary boring map. The maps used are taken from Stamen, a site which produces speciality maps. There are watercolor maps, fire maps, terrain maps, and many other types. As you can see in the screenshots posted, the map used for my area is watercolor. The maps selected to be shown are also based on time of day and weather. If it’s dark and gloomy outside, a darker tone of map will be used. If it’s bright and sunny, it will be a light-colored map. The plugin is completely free, so go check it out. A few users reported that it’s not working for their region, so it may be limited to the US only. In addition, it took a few seconds for the service to load on my device, but be patient. Update: According to the developer, the popularity of the app was putting a strain on the Stamen servers, so until they can fix the issue, he had to remove the app.